First, a little history to put everything in perspective. In 1995 the NBA expanded into Canada with the Grizzlies and Raptors. The Raptors had young talent like Damon Stoudamire, Marcus Camby, Vince Carter and Tracy McGrady and eventually made the playoffs for three straight seasons from 1999-2000 through 2001-2002. The Grizzlies on the other hand were perennial basement dwellers led by Bryant “Big Country” Reeves. In their 6 seasons in Vancouver the Grizzlies never came close to a winning record, going a combined 101 wins and 359 losses. Their best season was their last in Vancouver, posting a 23-59 record in 2000-2001. They actually had a promising young core for their final season in Vancouver – Mike Bibby, Michael Dickerson, Shareef Abdur-Rahim, Stromile Swift and Othella Harrington (who was traded to the Knicks mid-season). You can see them all in the Vancouver Grizzlies Team Gallery. In February 2001, David Stern gave the Vancouver Grizzlies permission to explore moving to another city. At the time, it was believed that they would move to St. Louis, New Orleans, Las Vegas or Nashville. A month later in March 2001, the Grizzlies filed an application to move to Memphis (the Charlotte Hornets also filed an application to move to Memphis…they would end up in New Orleans a year later for the 2002-2003 season). The 2001 NBA Draft was held on June 27, 2001. At that time the Grizzlies were still technically in Vancouver, even though they had moved their basketball operations to Memphis. The NBA Relocation Committee hadn’t officially approved the move yet. On the night of 2001 draft, Pau Gasol was selected #3 overall by the Atlanta Hawks. But the evening prior to the draft, the Hawks had worked out a deal with the Grizzlies. The Hawks would take Gasol at #3, and trade him to the Grizzlies in exchange for the Grizzlies top-scorer Shareef Abdur-Rahim. 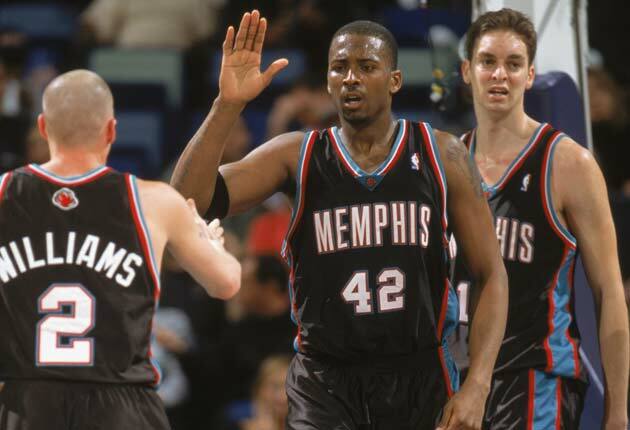 The Grizzlies also got Lorenzen Wright in the deal. The Grizzlies then picked up Shane Battier with their normal pick at #6. So technically, Gasol was drafted by the Vancouver Grizzlies. The following day on June 28, 2001 the Grizzlies traded Mike Bibby to the Sacramento Kings for Jason “White Chocolate” Williams and Nick Anderson. Within 48 hours the Grizzlies had shipped off their two most promising young stars…keep in mind they were still the Vancouver Grizzlies. The next day on June 29, 2001 it was announced that the NBA Relocation Committee had approved the Grizzlies’ move to Memphis and on July 3, 2001 the Board of Governors officially approved the relocation. The Grizzlies became the first NBA team to relocated since 1985 when the Kings moved to Sacramento from Kansas City. Now that I’ve laid out some context, let’s look at the Champion Jerseys that were produced for the Memphis Grizzlies. Again, keep in mind that 2001-2002 was the Grizzlies first year in Memphis and the last year that Champion produced jerseys. So Champion most likely cranked out one production run for every team that year so that they wouldn’t be stuck with inventory. Also keep in mind that Vancouver Grizzlies jerseys were pretty scarce to begin with since they didn’t have much star power, were located in a bad basketball market and were terrible. The most common Vancouver Grizzlies jersey is Bryant Reeves, but he never played a regular season game in Memphis and retired in January 2002 due to chronic back issues that had limited his productivity for several years. And the team had traded away it’s two brightest stars in Bibby and Abdur-Rahim while they were technically still Vancouver. Combine all of this and it turns out Memphis Grizzlies Champion jerseys are limited in players and tough to find. Jason Williams had fallen out of favor with the Kings in 2000-2001 and was demanding a trade. Despite Mike Bibby blossoming into a top point guard, the Grizzlies needed to put butts in seats and generate some excitement in Memphis. So trading for the flashy Jason Williams made sense. For Champion, this trade was a blessing. Jason Williams had been a top-five selling jersey ever since his rookie season in 1998-1999, and in 2000-2001 Williams had the second highest selling jersey in the league, behind Allen Iverson. Williams also switched his uniform number from #55 (which he had worn since his freshman year at Marshall) to #2. Shane Battier was technically the Memphis Grizzlies first official draft pick in history (remember they were still technically Vancouver and Gasol had been drafted by the Hawks and traded for three picks prior to Battier). Battier was also a household name from his four years at Duke where he was an All-American on the court and in the classroom, and won a National Championship in his senior year, just two months prior to the draft. The squeaky clean Battier was a stark contrast to Jason Williams, who had bounced around in college with coach Billy Donovan from Marshall to Florida, and was subsequently suspended for the remainder of his 1997-1998 sophomore season for marijuana use (not to mention a five-game suspension in 2000-2001 for violating the NBA drug policy). So it makes sense that Champion would produce Battier’s rookie Memphis jersey, and it is the most common of the Memphis jerseys. Lorenzen Wright came to the Grizzlies as part of the draft-day deal that sent Shareef Abdur-Rahim to the Hawks in exchange for Pau Gasol. Wright is probably more notorious for his unsolved murder than his days in the NBA, but he was a decent NBA journeyman who had a decade-long career. The reason Champion produced his Memphis jersey was because Wright was a hometown boy who grew up in Memphis and played college ball at the University of Memphis. Nick Anderson came over from the Kings with Jason Williams in the trade for Mike Bibby. At this point of his career, Nick Anderson’s best days were behind him. Jason Williams worked out with Nick Anderson in Orlando prior to the 1998 NBA draft. Anderson was basically brought to the Kings from the Magic to be a mentor to Williams, and was really only brought to Memphis to serve the same role (as well as provide some veteran leadership in the locker room). Champion produced Anderson’s jersey purely because of name recognition, as he only appeared in 15 games off the bench in 2001-2002 . Nick Anderson’s Grizzlies jersey is the toughest to find. Michael Dickerson was drafted by the Houston Rockets 14th overall in the 1998 Draft. He played significant minutes for the Rockets during his rookie season, which was cut short by the NBA lockout. Prior to the 1999-2000 season, Dickerson was part of a three-team, eleven-player deal that brought Steve Francis to the Rockets. At the time, it was the largest trade in NBA history. Francis was selected 2nd overall by Vancouver in the 1999 draft but did not want to play for the team, thus forcing a trade prior the start of the 1999-2000 season. Dickerson found instant success in Vancouver, starting all 82 games and averaging over 18 point per game during the 1999-2000 season. After another consistent season in 2000-2001, Vancouver signed Dickerson to a 6-year , $43 million extension. So when the Grizzlies moved to Memphis in 2001-2002, producing a Dickerson jersey was a no-brainer since he was a rising star and face of the franchise. However, just four games into the 2001-2002 season, Dickerson suffered a stress fracture in his groin and missed the remainder of the season. In 2002-2003, he reaggravated the injury and played just six games. In 2003 he was forced to retire. Despite Dickerson’s productivity and popularity in Vancouver, his Memphis Grizzlies Champion jersey is very tough to find. 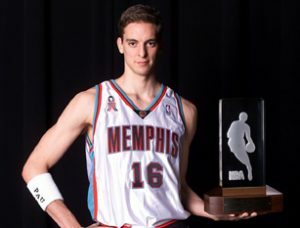 So why didn’t Champion produce a Pau Gasol Memphis jersey? 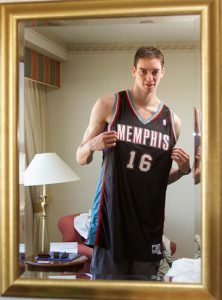 So now back to the main question, why didn’t Champion produce a Pau Gasol Memphis Grizzlies jersey? It’s obvious that Champion did one production run for the 2001-2002 season because jerseys from that season are limited in quantity. And this makes sense because Champion didn’t want to inventory on-hand at the end of the season when their NBA license expired. And it appears this production run for the Grizzlies occurred shortly after it was officially announced Memphis would be their new home…all four players (Williams, Battier, Anderson and Wright) were acquired on consecutive days at the end of June 2001. So Champion most likely printed the jerseys in July or August. Pau Gasol was the highest international player ever drafted when he was chosen #3 overall in 2001 (a year later Yao Ming would be taken #1 overall), and only the second Spaniard to play in the league (Fernando Martin played for the Trail Blazers during the 1986-1987 season). However, he was a complete unknown here in the states to the casual NBA fan. Even some teams had no clue about Gasol. He had played on the Spanish junior team since the age of 15, and was a 19 year-old on the Spanish junior team that beat the favored US team in the 1999 FIBA junior world championships. But he never starred on these teams, and at one point was enrolled at medical school at the University of Barcelona. Eventually he focused full-time on basketball and joined Spanish club team FC Barcelona. Gasol wasn’t a star until the 2000-2001 season when he took over for former-NBA star Rony Seikaly and became starting center. FC Barcelona would go on to win the Spanish National Cup (Copa del Rey 2001) championship by defeating Real Madrid on March 18, 2001. Gasol was named MVP. Three months later Gasol was in NYC for the NBA draft. 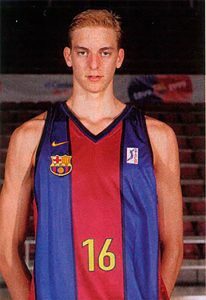 When Gasol was drafted, he still had one year left on his contract with FC Barcelona. In order to get out of the contract, he would have to do a buyout for a reported $2.65 million. Gasol himself would have to negotiate the buyout and pay the money, as the Grizzlies could only contribute up to $350,000 directly. So either Gasol would play out his contract and further develop his skills with FC Barcelona for the 2001-2002 season, or he would sign and play with the Grizzlies and use his signing bonus to buyout his FC Barcelona contract. Gasol wanted to do the buyout and join the Grizzlies immediately, but the buyout negotiations with his Spanish club took some time. The goal again was to get the amount of the buyout under the max signing bonus that the Grizzlies could offer, that way Gasol wouldn’t have to dip into his base salary to cover the buyout. The negotiations stretched through July and August, and finally on September 17, 2001 Memphis officially signed Gasol to a three-year deal. Within a year Gasol would go from unknown to Rookie of the Year. 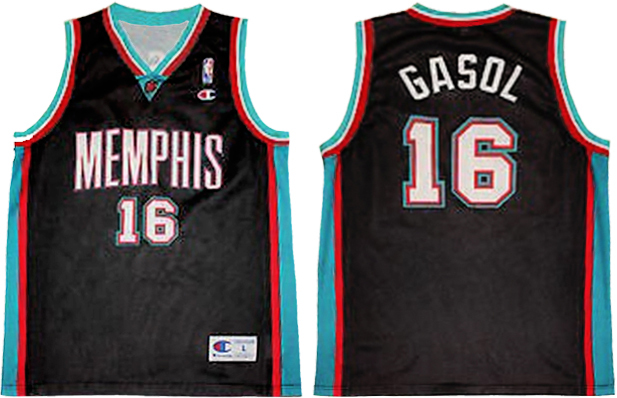 Champion missed a huge sales opportunity by not producing Gasol’s Memphis jersey. Hindsight is always 20/20, but it is obvious they made a calculated business decision. They were in their final year of producing replicas and didn’t want to over-produce and have inventory on-hand at the conclusion of the 2001-2002 season. It appears Champion did one production run in July or August of 2001 in order to get product into market in time for the start of the 2001-2002 season. The fact that Gasol didn’t officially complete his buyout and sign with the Grizzlies until mid-September means that Champion missed the opportunity to slot his jersey into production. And even if Gasol had completed his buyout earlier, Champion still might not have produced his jersey since he didn’t have name recognition among NBA fans. So if you are looking for Pau Gasol Champion jersey from his rookie-year with the Grizzlies, you’ll have to settle for the Champion Europe version. Thanks! Nothing for sale on this site…purely for enjoyment, learning and discussion. First of all awesome site, my friend shared this with me. I have been looking for something like this for a while now. Do you have any plans to add the teams you are missing? (T-Wolves, Sonics, Warriors, 76ers, Suns, Spurs) thanks! Thanks for checking out the site. At one time or another I owned most of the jerseys on this site, but over the years have dwindled it down to just a handful in my personal collection. But back in the early-mid 2000s, I had about 300 jerseys at any given time. I have a Reggie Miller Olympics jersey from 1996. The front of the jersey has a #6 but on the back it has #10! Was wondering if you can shed some light and why that may be. Just a misprint. Champion Outlet stores would often sell the misprints. You’ll see some jerseys where the player names were printed on the front, some where players from one team were accidentally printed on another teams jersey, etc. The misprints aren’t really collectible. Long time champion replica collector. Love the site. Best ever. Thank you. Thanks for checking it out. I’m continuing to grind out the remaining galleries and add content as I find time. I have a rookie era Kevin Garnett Minnesota Timberwolves jersey. I initially purchased it to wear but when I received it, it was way too long. I was going to get it tailored to fit me like my other mid 90s authentic sewn jerseys that I personally bought from stores in 95/96 but as I started inspecting this jersey I thought perhaps it was something more special than the typical authentic / replica jerseys out there. It’s the classic mid 90’s MN Timberwolves jersey, in blue. Says WOLVES across the chest. The word WOLVES is in white which is sewn to the jersey itself, and then the word WOLVES in green which is sewn to the white letters. This is the same for the #21 on the front and back. The brand name is Champion. Has the jock tag in the lower corner which is sewn to the jersey on all 4 sides. Says Made in U.S.A. RN 26094. There is no tag that says “Tailored exclusively for MN Timberwolves. Inside the jersey on one of the seams says” Inspected by 045-900 with the 900 crossed out and written below says 909 in pen or pencil. It’s very faint. The jock tag says size 48, which I know from having a couple other authentic jerseys measures roughly 24″ pit to pit and 32″ top to bottom. This jersey measures roughly 24.5-25″ pit to pit and about 35-36″ from top to bottom. So my guess is this is a +3 inches jersey? Lastly, here is the head scratcher. The front side of the jersey has 2 layers of fabric. Meaning essentially I can put one hand on the outside of the jersey and one hand on the inside and pull apart and clearly see two layers of fabric. While the back side only has 1 layer. I’ve talked with some collectors who have game issued / game worn Garnett jerseys and their jerseys have the 2 layer in front one layer in back too. Other things: if you flip the jersey inside out, all the lettering and numbering are sewn to the blue fabric and is sewn on with white thread. The arm and head holes have the green and white fabric sewn to the blue with white thread too. It’s got the classic slit at the bottom on both sides of the jersey. Nothing about it looks fake or replicated. The blue fabric of this jersey isn’t the mesh feel I have with other mid 90 jerseys. I have a replica Garnett Timberwolves jersey from his rookie season, where all the letters and numbers are screen printed on, and the feeling of both jerseys are the same. I read that the Knicks and Timberwolves jerseys from this era didn’t use the mesh jerseys that other teams used. So my question is, could this be a game used / game issued jersey? If it is indeed a knock-off, whoever did it did an outstanding job faking it. I’d be more than happy to show pictures if anyone wants to chat about it. Thank you for reading my extremely long post and I appreciate any and all feedback. Thanks fellow 1990’s Champion Brand NBA jersey lovers! !